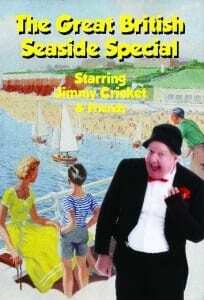 Jimmy Cricket’s summer season in the idyllic Norfolk seaside resort of Hunstanton gets under way on Monday (5 August). The show is called the Great British Seaside Special and takes place at the Princess Theatre in the coastal town. It will be on every Monday, Tuesday and Wednesday, from the first week of August through to 4 September. There is a mix of 7.30pm performances and 2.30pm matinee shows. It will also feature the multi-instrumentalist Ian Larkham, the balloon-modelling skills of Bob Wooding and the Seaside Special company of talented singers and dancers. The show will be directed and choreographed by Ian’s wife, Michelle. The show is produced by theatre manager Brian Hallard, who was instrumental in the reopening of the theatre last year. Tickets are priced between £11.50 to £13.50, with children able to grab a seat for £7.50 and senior citizens from £11.50 to £12.50. Visit the theatre’s online box office here or telephone on 01485 532252.